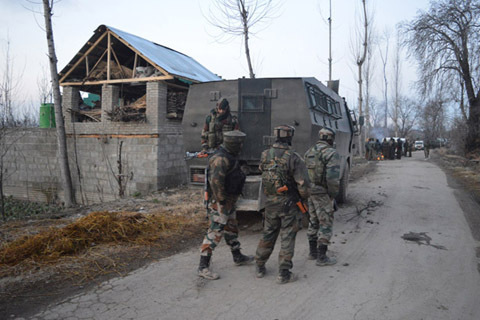 Two militants and an army soldier were killed and two Central Reserve Police Force (CRPF) personnel wounded in a gunfight in south Kashmir’s Kulgam district on Tuesday. A police official said that two militants were killed in the gunfight. “The bodies are yet to be recovered,” he saiid, adding that the slain are believed to be affiliated with Lashkar-e-Toiba militant outfit. He said the operation is going on. He said that an army soldier, identified as Prakash Yadav, was wounded in the firefight. He was rushed to a hospital where he succumbed. The official said that two CRPF personnel, identified as sub-inspector Amit Kumar and Constable Avnish, were also injured in the gunfight that broke out around 1 am in Redwani area of the district. Local sources said that sound of huge blasts rattled the area today morning. They said that a joint team of army’s 1RR, CRPF and SOG cordoned off Redwani after midnight following inputs about the presence of militants. They said the militants opened fire after a search party approached the house in which they were hiding. The forces retaliated, leading to a gunfight which was on when last reports came.